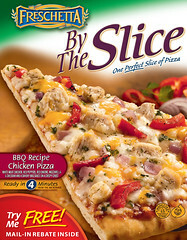 I was recently given the opportunity to try out FRESCHETTA® By the Slice ! Unfortunately, I could not find a store in my area that carries this product, so I was unable to use my coupon and try this product. Although I wasn't able to try FRESCHETTA By the Slice, I do think that they have a great idea here. I know that I usually eat more pizza than I need to. It is hard when there is an entire pizza sitting in front of you... I always seem to justify that extra piece in my mind. FRESCHETTA By the Slice can help save me from that! I would have tried the BBQ Recipe Chicken, if I had had the chance! FRESCHETTA has given me an extra coupon, and a 6 piece storage set, to giveaway to one lucky U.S. reader! Leave a comment telling me about the best pizza you have ever had. Giveaway ends 4/25/11 at 11:59 EST. One winner will be chosen and announced on this blog. My favorite pizza is Hawaiian. Yummy! my boys love Freshetti. I am so-so when it comes to pizza. I like lots of veggies on mine! also-if you cut your pizza and right then and there- bag all the rest and put it in right into the fridge- it's easier to eat just the 1 or 2 slices.- that is what I do sometimes. I love papa john's ham pizza. Best pizza I ever had...had to be a pepperoni, onion, green pepper and 3 or 4 different cheeses on it. I don't even remember where I had it from but it was so good. The best pizza I ever had was a Feta Spinach Spinach pizza~mmmm, good! Pizza John's in Derby, KS makes the best pizza I have ever eaten - supreme (no olives) with just the right amount of sauce, thin crust, not too much cheese and some herbs sprinkled on top. The best pizza I have ever had is this local pizza shop and got it growing up and love to still get now!